In addition to our established residential community at Vistas de Chirripo, with its spectacular mountain and valley views, we are now pleased to be able to offer developed oceanview acreages on the southern Pacific coast of Costa Rica. As we did with Vistas de Chirripo, our new location at Vistas del Diquis is being developed in a sustainable manner, leaving forested and creek areas intact, reforesting other select areas, positioning building sites on naturally suitable and stable terrain, and planning large green areas as part of the development plan. Living in this region of natural beauty while leaving a very low environmental footprint is indeed possible. Vistas del Diquis overlooks the huge Diquis delta, with views including Cano Island and the Osa Peninsula. The Grande Terraba and Sierpe rivers meander through the delta amidst a great expanse of undisturbed mangove growth. The Diquis area is also of significant archaeological interest, with most of the famous pre-Columbian stone spheres having been found here, leading to the designation of the Diquis Delta as a Unesco World Heritage Site in 2014. We are near the local mountain community of San Rafael de Cortes in the canton of Osa, situated at an elevation of 700 meters above the ocean, with beautiful ocean views, ocean breezes, and a wonderfully temperate climate removed from the extreme heat and humidity of the coastal area directly below us. Climate in Costa Rica is largely dependent on elevation, and being 700 meters up from sea level is perfect for everyday living, with no need for either air conditioning with proper ventilation or for heating. The nearest coastal communities below us are Ciudad Cortes and Palmar Norte to the south and Coronado and Ojochal to the north. A new, modern regional hospital is only a few kilometers down the coastal highway at Ciudad Cortes. A regional airport is nearby at Palmar Sur and an international airport between Palmar Sur and Sierpe is in the planning stages. All of the adventure tourism destinations on the Osa peninsula, including Corcovado National Park and Drake Bay, are easily reachable from Vistas del Diquis, as is the new full-service marina in Golfito. Our prepared building sites are spread along a large natural ridge, all with ocean views and ocean breezes. All building sites have been levelled, entrance roads have been built and gravelled, all rainfall drainage infrastructure has been completed, and landscaping work is underway as of 2016. All development work has been permitted by the national environmental secretariat after environmental studies were completed. Our development includes a large common preserve area, with nature trails in the forest and creek areas below the building sites. The natural forested area has been undisturbed by our development of building sites. Abundant wildlife can be seen and heard, including both howler and spider monkeys. The shrill song of the toucan will greet both sunrise and sunset. 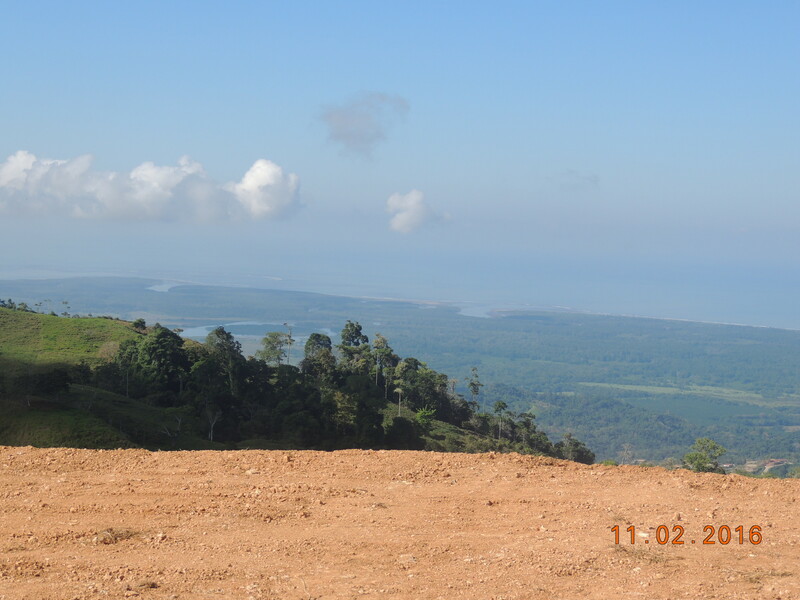 Lot sizes average 2 hectares (5 acres) and our pricing now in Phase 1 of Vistas del Diquis is starting at only $75,000 USD for lots with good-sized building sites of approximately 5,000 sq. feet. We also have lots with exceptionally large building sites, up to 17,000 sq. ft. that would be suitable for an eco-lodge or a family enclave, priced up to $190,000. All lots come with electricity, fresh mountain spring water, access to nature trails, and an abundance of sunshine! Access to Vistas del Diquis is off the Costanera Sur, the excellent southern Pacific coastal highway, at km. 196. There is a decent, gravelled road that is relatively level for 4 km. to the small community of Balsar and then another 4 km. on a 4 wheel drive, gravelled, road that climbs up the mountains to the small community of San Rafael and to Vistas del Diquis, with amazing scenery en route. The nearest services are at either Ciudad Cortes or Palmar Norte, both just minutes away from the highway entrance, with supermarkets, restaurants, banking and other services available in either town. The closest hospital, the modern Tomas Casas Hospital serving the municipality of the Osa, with full emergent care and a range of diagnostic services, is also only minutes down the highway. There is a newly developed golf course at San Buenaventura, 10 minutes down the highway, a selection of beautiful beaches within 20 minutes down the highway including Playas Tortuga, Pinuela, Ventanas and Ballena, and a variety of fine restaurants at Ojochal only 15 minutes north on the highway from the entrance road to Vistas del Diquis. Please contact us on the sidebar form above with any questions you may have about Vistas del Diquis and our available lots, including pricing and payment details. We are happy to promptly answer all enquiries and to offer advice and assistance to facilitate your travel arrangements to and around this wonderful region of Costa Rica. Our travel credit program will cover your travel expense from abroad should you choose to purchase a lot when you visit. We can help you select an architect and a builder for your dream home or we can build a turn-key home for you. Either way we are at your disposal to help with your relocation to this beautiful and tranquil part of the world. Pura vida.